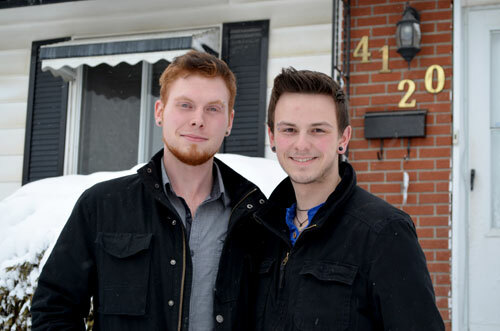 Brady Pierce-Brady (left) and his partner Kyle Leetillteet (right) stand in front of the property where they used to live in an illegal basement suite. Brady Price-Berry lived in an illegal basement suite from November 2013 to February 2014 with his partner Kyle Leetillteet. He says he was forced to lie about his sexual orientation in order to live there. Price-Berry moved in after a falling-out with his previous roommate. “I needed somewhere to live as soon as possible,” says Price-Berry. He found the suite on Kijiji for only $850 per month for two bedrooms and one bathroom. Price-Berry says living there was difficult from the beginning. Firstly, he says the suite was not cleaned before he moved in. He says the upstairs tenants would constantly argue, which bothered Price-Berry who was living below. He says he would also have to battle with them over use of the shared laundry machine. If he attempted to use it, Price-Berry says the upstairs tenants would take out his wet laundry and put in their own. However, Price-Berry says his biggest struggle with living in the suite was that he was unable to live authenitcally. “I also could not speak about Kyle, my partner who lived with me,” says Price-Berry. He says that during the interview process, the landlord told him he would not rent the suite to someone who is gay. At the beginning of February, Price-Berry’s landlord told him that he was being evicted and that the suite was actually illegal. Because of a parking complaint from a neighbour, the City of Calgary had discovered the illegal suite and was going to take away the appliances. “The suite was cleaned top to bottom when I left. But the landlord did not give me the full damage deposit back because of ‘miscellaneous charges’ and a cleaning fee,” says Price-Berry. He says he only received $300 out of a $850 damage deposit. Today the couple lives in a home in Beddington where they pay $1,700 per month in rent.